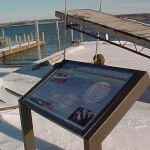 The Watershed Center was busy in 2004 leading an effort to develop and place educational signs around the Grand Traverse Bay and its watershed. 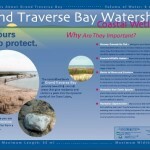 This project was made possible through a grant from the Michigan Department of Environmental Quality’s Nonpoint Source Program. 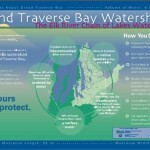 These educational signs inform the public regarding general watershed facts, clean boating and invasive species, coastal wetlands, and the Chain of Lakes watershed. 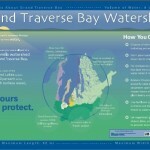 Additionally, a three panel kiosk will be placed at Hull Park in Traverse City teaching visitors about the newly upgraded wastewater treatment plant, historic Boardman Lake, and the importance of rain gardens. Special thanks go to Corbin Design for donating design work for the Clean Boating, General Watershed, Chain of Lakes, and Coastal Wetland signs. 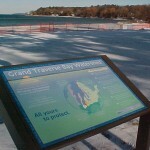 Other partners on this project include: DEQ, National Park Service Rivers & Trails Program, Grand Traverse Conservation District, US Fish and Wildlife Service, Tip of the Mitt Watershed Council, City of Traverse City, Britten Media, and the many townships and villages who agreed to place signs on their property. Thanks to everyone who assisted in this large effort!